WPP, hit with a 17.8% stock drop from $119 to $84 in the past 52 weeks, is putting pressure on its units in a move to bolster net. Its Ogilvy unit is undergoing a restructuring, eliminating PR as a separate function. It is being combined with advertising and marketing. PR Week/U.S. had reported $375 million in revenues and 2,703 staff for 2016 for Ogilvy PR and the Holmes ranking gave it $361M in revenues. Ogilvy spokespeople have disavowed such figures. The 2016 O’Dwyer’s Directory of PR Firms had a full page listing for Ogilvy PR that had a 45-line “Agency Statement,” 10 offices, five staffers by name including Christopher Graves as global chair and Stuart Smith as worldwide CEO, and 30 accounts, from ACT, American Express, Bayer and BP to Unilever, UPS and Vodafone. This was cut to nine lines in the 2017 Directory. Ogilvy currently has one subscription to O’Dwyer’s. Three staffers are listed as members of PR Society of America. 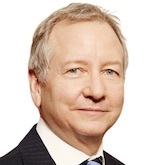 John Seifert is worldwide CEO of Ogilvy & Mather Worldwide. PR industry subscriptions to trade media have dwindled in recent years as PR practitioners have increased their use of social media and house websites to transmit messages. PR Reporter, PR Quarterly and three Ragan publications stopped publishing. Paul Holmes stopped publishing the magazine Reputation Management but has continued to supply news and commentary on his website. New York Times dropped its daily ad column in 2015 after 82 years. It covered PR although infrequently. The following story, from the March 28, 2017 O’Dwyer website, shows the growth of independent PR firms. Edelman leads O'Dwyer's ranking of PR firms again, posting $874.9M in 2016 net fees, up 2.4 percent. W2O Group ($122.7M, +33 percent) bumped APCO ($120.6M, +1 percent) down to third place. Finn Partners ($76.7M, +7.3 percent), ICR ($55.6M, -1.0 percent), and Padilla ($42.4M, -1.9 percent) are joined in the top ten by newcomers Prosek Partners ($31.2M, +28.1 percent), Racepoint Global ($29M, +7.8 percent), Coyne ($27.3M, +26.9 percent), and Fahlgren Mortine ($24.4M, +18.9 percent). Eighteen of the top 25 firms posted year-over-year gains with 12 showing double-digit growth. Overall, 90 of the 121 ranked firms had a positive change. 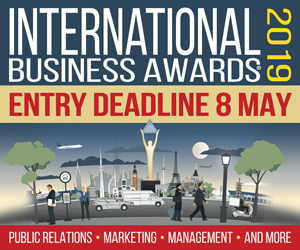 O'Dwyer's has the only rankings by PR specialty: agriculture, beauty & fashion, entertainment, environmental & PA, financial & investor relations, food & beverage, healthcare, home furnishings, professional services, sports, technology, and travel & economic development. Firms are also ranked in 13 key cities/regions such as New York, D.C., Southeast, Chicago, and Los Angeles. Rankings participants were required to submit the top page of the latest corporate income tax return and W-3, establishing them as PR firms rather than ad agencies or other types of businesses. O'Dwyer's is the only ranking that requires this documentation. WPP, with revenues of $19.9 billion, has debt of $9.82B, a total debt/equity ratio of 76.35 and a current ratio of .99. Omnicom, second biggest conglomerate with $15.4B in revenues, has debt of $4.98B, a total debt equity ratio of 168.86, and a current ratio of .89. OMC’s stock has dropped from a 52-week high of $89.66 to $67. The weakening in the ad market is due to digital disruption, activist investors and the low cost of capital money, WPP CEO Martin Sorrell told CNBC. WPP's latest earnings report showed a larger-than-estimated decline in advertising spending by consumer-product companies. The stock declined more than 12 percent on the news. While the current outlook is bleak, digital disruption provides opportunities for growth, Sorrell said. "It's the digital disruption in consumer consumption of media, the digital disruption you see in distribution, and the digital disruption you see in production through 3-D printing, and digital forms of production, autonomous cars, electrical cars, whatever that is disrupting legacy models," Sorrell told CNBC's "Squawk on the Street." "It's all of the above. That for us is a bigger opportunity." About 41 percent of WPP's $20 billion revenue comes from digital sources, signaling the company has made the transition to today's digital world, Sorrell said. Still, he sees opportunities to expand. Google partnering with Wal-Mart to offer voice-enabled shopping — which will directly compete against Amazon — was an example of how companies can adapt to changing purchasing behavior, he noted. Sorrell said earlier in July that WPP would be investing heavily in digital services, particularly with Google and Facebook. 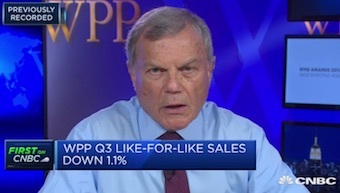 WPP's PR/PA units slipped 1.0 percent during the third-quarter as Sorrell warned investors of slowing industry growth following a good run of seven years. "It does seem that in the new normal of a low growth, low inflation, limited pricing power world, there is an increasing focus on cost reduction, exacerbated by a management consultant emphasis on cost reduction and the close to zero cost of capital funding of activist investors and zero-based budgeters," wrote Sorrell in WPP's trading update.